The moment is fast approaching — you can’t wait for the arrival of the new addition to your family. You have to get everything in order so you will be properly prepared. Having a baby means a lot of changes and a lot of new purchases. One of the most important additions to any nursery is a diaper changing table. A diaper changing table is not a purchase to take lightly. You should not go in and just buy the first table you see sitting in the store. They are not all the same and there are things to consider when making your purchase decision. A diaper changing table will get a lot of use when your bundle of joy arrives. Whether you choose a free standing table or a dresser with a changing pad attached to the top, you need to consider several things to ensure you are selecting a table to fit your needs. Inspect the table’s construction. Is the table wobbly? Does it set steady? Does the table seem flimsy? Also check to see if there is a securely attached rail on the side to ensure the baby doesn’t fall off of the table. Consider the table’s height and width. With a variety of tables available, they come in a variety of shapes and sizes, so you want to make sure you select a table that fits into the nursery. 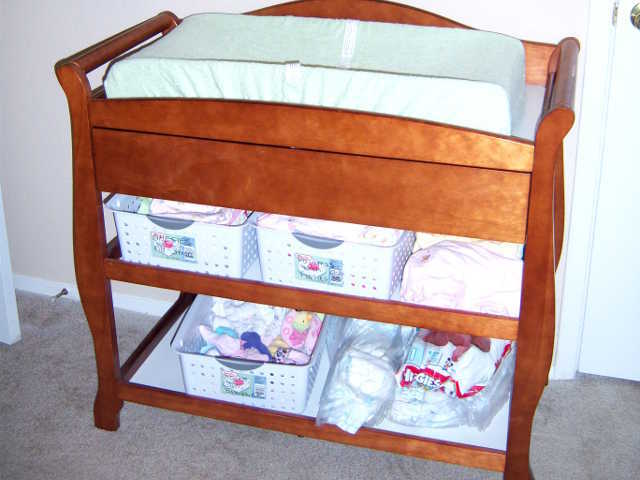 If you are low on space, you may want to get the combination dresser and changing table. It serves two purposes in one piece of furniture. You have lots of baby stuff. Consider everything it takes to change your baby’s diapers. You have to have diapers, wipes, washcloths, lotions, clothing, and other items on hand. It may be a wise choice to choose a table with storage space. 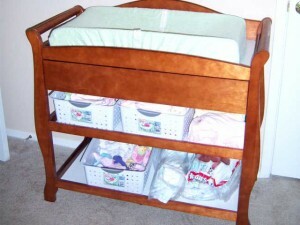 Even if you get a free standing table, many of them have shelves or racks underneath the changing table area. Does it Work with Your Nursery? Another important aspect is to consider the table’s appearance. Would it work with your nursery’s furnishings? As an example, if the other accessories are walnut, you probably wouldn’t want to bring in an oak diaper changing table. As mentioned earlier, you need to consider the size and space. Do not get a table too large for the nursery. If you are short on space, you need to go with a diaper changing table on top of a low dresser. If your baby’s room is small, don’t get the largest diaper changing table they have available in the store. So, have fun when you go out shopping for baby items, but consider these important things to ensure you have made the best purchase decision to meet your needs as well as the needs of your baby. It can be an exciting as well as confusing time, but plan ahead and choose wisely. You want to be able to function as comfortably as possible so you can enjoy your little one’s first months.